I spent time today with a young woman who started her own business and has been dealing with the kinds of issues that come up sometimes when people prove to be other than what you expected. As a lawyer and as a person, I’ve seen it again and again. Relationships – both professional and personal – end, sometimes most unexpectedly. And sometimes the unexpectedness hurts more than the actual severance itself. This woman has been fighting battles for a while now, but she’s on the downhill side. She’s putting her attention on the things that matter to her, and she isn’t looking back, except to gain knowledge for the next round. When we first started talking, I was a little anxious about the time because I needed to get into the office to get some stuff done. But as we spoke, I realized more and more that I needed to pay close attention. I realized that I was in one of those conversations that would stay with me for a long time. As I listened to her, I saw so much of what I want in myself. I saw a determination to move forward. I saw a confidence that past successes would be repeated and exceeded. I saw a peacefulness of spirit that comes with having treated others well, even when that courtesy may not have been returned. I didn’t live her experience, but I can learn from her example. I’m thankful for that example. I’m thankful that, despite our schedules and all that we both have going on right now, we made the time to sit and talk. For me, at least, it was time incredibly well spent. I’ve been at home this morning awaiting the delivery of a new computer. My old computer is a 33 GB PC that I bought in 2004 and have used up. The computer is literally full. Last year, it got full and ran so badly that it sometimes took three or four minutes to open a simple Word document. When that happened, I started researching new computers and talking to the computer guy at my old firm, and he saved me. He doctored the computer a bit and deleted off of it the pre-installed program files I didn’t need and never used, and cleared up so much space that it worked beautifully, almost like a new machine, for a while. But here again, it has started to lag. For the last four or five months, I’ve been looking for additional excess files to delete. I’ve tried to cull through and delete duplicate photos, old versions of my resumes, and any random files I didn’t recognize or was certain I would not need, including massive law school outlines that I’m sure I did not create and probably never even used. I’ve scoured the depths of my little machine, and I’ve run out of things I can delete. I considered buying a little storage drive and moving my many pictures off the PC onto the drive to create space and extend the life of my little old machine. But I decided against it. Last week, as I thought ahead to the work I’ve got lined up and the business I am starting, I decided to pull the trigger on a new computer. I decided that my new life warrants the new beginning of a new computer. In fact, I splurged on me and bought a Mac. It feels like Christmas come early. A beautifully packaged box came less than an hour ago. I opened it and extracted a gorgeous piece of equipment from the shipping materials. I plugged it in and turned in on and we’re off! For me, a new computer is like a new house. It’s fun to take the stuff from an old house and rearrange it in a new one. Some of the stuff you keep. Some of it you don’t. You discover the quirks of a new space and find a way to make it your own. Every move feels new and fresh and promising. Likewise, this computer feels new and fresh and promising. One funny thing happened though in the first moments of working on my Mac. I turned on the computer and opened the Pages function. Immediately, it told me that updates were available. Seriously? The machine just came out of the box, and it’s already ripe for updates? That seems wrong somehow. But rather than be annoyed, I’ve decided to appreciate the readiness for updates. Constant updates mean constant improvement. I like improvement. I’m at a place where I’m ready for improvement. I’m ready for a fresh start. I’m ready to learn new things and have new experiences. I’m ready to move into a new space and discard bits of the past, especially those unnecessary memories that bog me down. Rather than live in the space of what’s always been and patch and treat it to keep it alive, I’m ready to step forward into the space of what can and will be. I already can tell that my Mac and I are going to have lots of fun together. Updates already? Bring them on. It’s a small word. Pets. I ramble on about mine all the time because they are precious and funny and add tremendous amounts of joy to my life. This time, though, the story is not about Bread and Butter. It’s about a dog whose name I don’t know. I watched a triathlon this weekend. As is often the case in races, family members ran through the finishers’ chute with the competitors. Little kids. Older kids. People raced to the finish line hand in hand with the folks who love them. I saw a number of people finish with kids so little that they could barely run on their own. In one instance, the kids were older and so rambunctious that one tripped, causing his brother to trip also, which resulted in a three-man pile up of kid, kid and father smack dab on top of the finish line. (That’s an example of why families sometimes aren’t – and perhaps should not be – permitted in the finishers’ chute.) Thankfully, all three stood up laughing. In each instance, the finish line volunteers placed the finisher’s medal around the neck of the companion child. The sweetest finish I saw was that of a man and his dog. 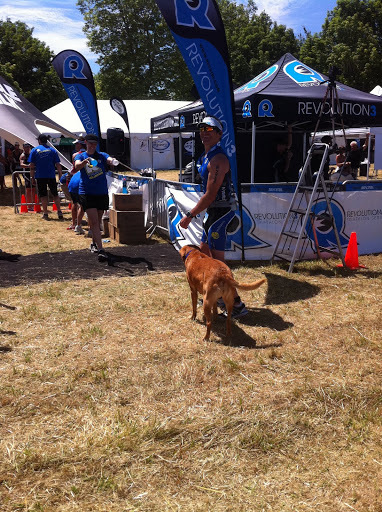 The dog ran with his owner through the finishers’ chute across the finish line. He stayed by his owner’s side and wagged his happy tail and looked up at his owner admiringly. The dog even wore the owner’s finisher’s medal. It was the sweetest thing to see this man laughing and running with his dog. Seeing this man and his dog made me think of the pet I grieve and the pets I know my friends grieve. Some of us age with our animals. 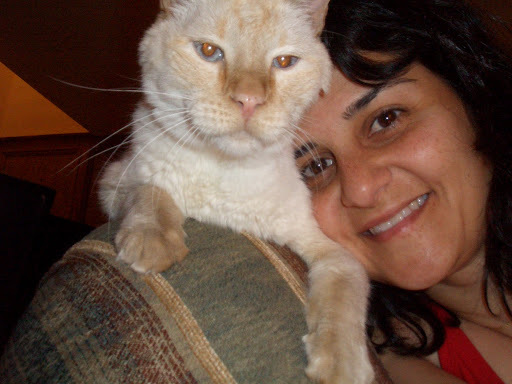 In 2008, I lost my Skylar, a cat who had been my family for eighteen years. My friend Jennifer recently lost a gorgeous black lab she’d had, I believe, since we were in law school eons ago. My friend Erin is grieving a dog she had for nine years. She reminds me that she had her puppy longer than she’s “had” her husband. These animals of ours are precious. They love us. They just love us, and we love them. They live in our homes and sleep in our beds and often spend day and night by our side. In some cases, they even run our races. And then they’re gone, and it’s hard, but it’s worth it. 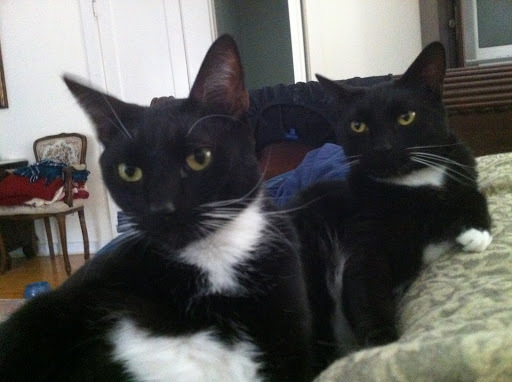 Loving them – having them and living with them – is completely worth every bit of the pain we experience in losing them. Pets. The word may be small, but the love is huge and remains huge even after they are gone.